A dramatic adventure tourism experience launched just days ago involves being propelled across a ravine by a giant catapult, reaching almost 100kph in 1.5 seconds before plunging suddenly towards the valley floor in a series of jaw-dropping bounces. The location is New Zealand, which is well on the way to becoming adventure tourism capital of the world, if it’s not already there. The operator, AJ Hackett Bungy New Zealand, is claiming world-first status for the new adventure tourism experience. The company’s co-founder Henry van Asch revealed the giant Nevis Catapult last week in the remote Nevis Valley near Queenstown, New Zealand. The Catapult gives thrillseekers up to 3Gs of force and speeds of almost 100km per hour in 1.5 seconds as they fly 150 metres out across a ravine before dropping suddenly towards the valley floor and experiencing a series of bounces. The official opening last week brought to fruition three decades of planning and development by van Asch and the AJ Hackett Bungy New Zealand team. “It’s hugely exciting to be here today, revealing the Catapult to the world, following years of playing around with the idea,” van Asch told his audience. He officially opened the Catapult experience by being launched – quite literally – across the Nevis Valley, with special guests and media watching on. “It’s a pretty unique feeling, surprising even,” he said. Housed in a pod and between a series of cables, alongside the infamous Nevis Swing, the catapult combines height, flight and speed using a bespoke high-speed winch system, which the company developed over years of research. 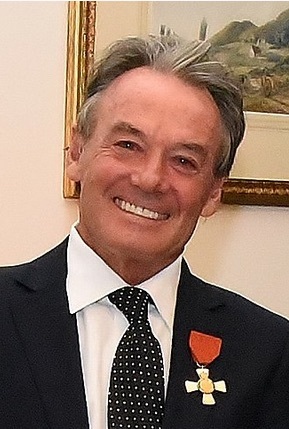 van Asch says he first came up with the idea when travelling around France during the 1980s with friend and (later) Bungy co-founder, AJ Hackett. van Asch says it’s significant to be unveiling the new experience in the company’s 30th year. Specialist new technology for the multi-million-dollar Catapult – partly funded by a NZD 500,000 New Zealand Government grant – was developed by the company’s research team before being built in an accredited testing facility in Christchurch and then brought to site for full-scale installation, testing and commissioning. Testing has been conducted out-of-sight over the past nine months – beginning with weighted barrels, before moving on to a test dummy phase and finally human testing. AJ Hackett says the Catapult is developed to internationally recognised safety standards and regulated under New Zealand adventure tourism and amusement device standards. Tourists who are pregnant or suffering from photosensitive epilepsy cannot be launched out of the catapult. The Nevis Catapult experience last four hours and costs NZD 255 for adults and NZD 225 for students. The Catapult Bus departs from the Queenstown Bungy Centre, Corner of Shotover and Camp Streets, Queenstown, daily at 9.20am, 10.00am, 11.20am, 12.00pm, 12.40pm, 1.20pm, 2.00pm and 2.40pm. Minimum age is 13. Children 14 and under require an adult to sign consent at check-in and accompany them on their experience. Participants must weigh between 45kg and 127kg. 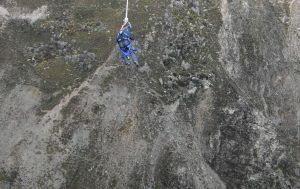 The world’s first commercial Bungy jump operation was established at the Kawarau Bridge “original home of Bungy” in 1988. AJ Hackett – which now offers ziprides, swings, a bridge climb, tower walk and Bungys across five sites in Queenstown and Auckland – is set to reach one million jumps from the Kawarau Bridge Bungy Centre next month.